Here's a brand new slot game from the team at EyeCon with a fun Cop's n Robbers theme and a superb look and feel with some excellent bonus features. Catch the bad guys as you play the latest online slots such as this one! This game is designed and developed by EyeCon, an Australian company that delivers great titles to the casino gaming market since 1997. 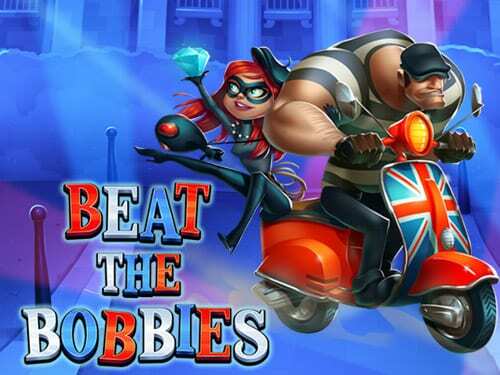 Games like Beat The Bobbies Slot is what made them famous in the digital gaming sector, with over 100 titles in their portfolio, all of them being designed for entertainment, with stunning graphics and top-notch gameplay and animations. Getting you to enjoy every single spin is their main focus, as this game-development company has invested a lot in highly-skilled professionals specialized on 2D and 3D graphic design. Don’t just take our words for granted, have a try yourself! 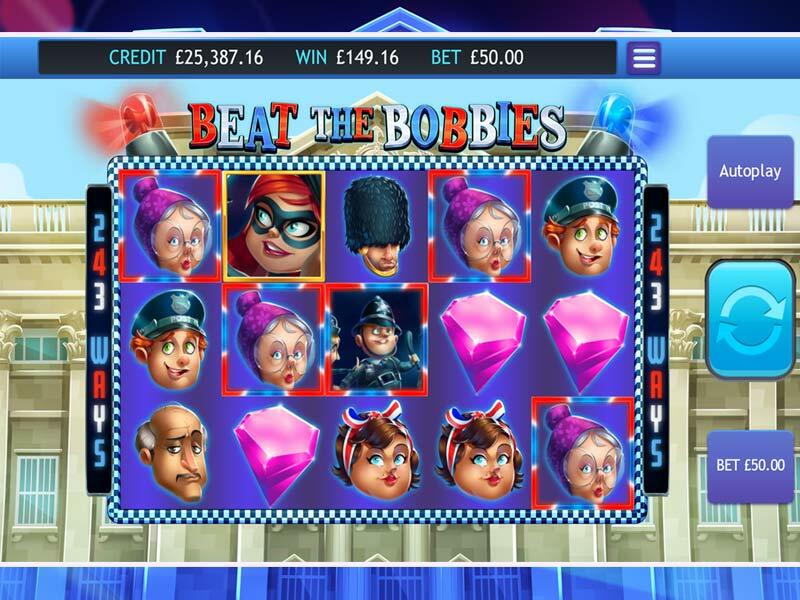 Get in the game and enjoy the winning feeling in an astonishing atmosphere with Beat The Bobbies slot game from EyeCon. You can view new slots games from EyeCon here. Are you into some adventure time? Well, pop on as you are about to be part in the heist of the century as some British lads are about to play cops and robbers and get out of this alive and with huge stacks of pound notes. If you fancy becoming rich overnight, then join these guys as you are about to change your life with Beat The Bobbies slot game online from Eyecon. Visually speaking, this beat the bobbies slot is well done, but a bit over the top when it comes to literal British stereotypes. Apart from that, it is set on a palace background, as you will see an old lady, a guardsman, a postman, an old man, a bulldog, a woman, a tiara, a crown, a gemstone and a ring, all presented as winning symbols on the reels. We have listed out a bunch of top-rated games to help you discover more slots to play. This 5 reels, 243 ways to win the game, is not all about the graphics, as it comes with bonus features that bring up to 320 free spins and multipliers up to 50x times your stake. The wild in beat the bobbies slot is represented by the hapless copper as he appears on the middle 3 reels only and he substitutes for any other symbol, apart from Penny, the cat burglar that represents the scatter in this game. Land a minimum of 3 scatter symbols and you can get up to 50x times your stake, while also triggering the Free Spins feature, where you’ll be offered a selection of free spin & multiplier combinations such as 8 free spins & 5x multiplier, 10 free spins & 4x multiplier, 15 free spins & 3x multiplier and 20 free spins with 2x multiplier. This feature cumulates as you manage to land the scatters once again, which means that you can retrigger more free spins, up to 20 times, which can result in you getting 320 free spins with a 2x multiplier or 128 free spins with a 5x multiplier.